"Honestly, I really just loved the TedTalk that you provided as a resource! I just loved hearing about how astrophysicists see the galaxy, and how they study the stars. I loved hearing about the way that light is used to figure out so many things, such as what stars are made out of. It's all just such a big new world for me as someone who's never taken an astronomy class." "The video of 'How Do We Study the Stars'--it really nicely put everything we'll be covering in the next few weeks with awesome visuals!" "I liked the YouTube video the best because I find it more fun to learn through hearing someone explain things with visual aids and illustration rather than reading about it." "I really liked the video. Like, I personally knew all this before but the idea had really good graphics." "I found it interesting that the brighter stars are ranked with smaller numbers and the dimmer stars are ranked with bigger numbers. I found this to be interesting because it was pretty simple to understand. Also the 'top tier' analogy made it more relatable." "The measurements of star's brightness, especially thinking about the distance of stars and how it can effect their brightness. the sun being not as bright as most stars is sort of funny to think about as it is the most intense for us." "That stars that aren't as bright can appear to be, just based on how close they are to Earth. I think this is interesting because for us looking at a star won't actually tell us how bright it is, instead it's like an illusion." "That you can detect temperatures of stars based off of their colors." "It's funny how we associate hot with red, but really the lighter colors; blue and white, represent the hottest temperatures." "To find out that hot objects glow because when they get hot, atoms/molecules get more agitated, which makes them move faster!" "Learning about the stars--in particular, being able to find the size of the star by luminoscity, color and math! I liked it because it did not seem too strenuous." "Learning about the different stars and how they are classified by their brightness, color." "One thing I just genuinely liked about the assigned reading was the mnemonic devices provided, like, 'Only Bad Astronomers Forget Generally Known Mnemonics.' It humanized the science for me a little and made the reading more engaging." "I'm interested in the different temperatures and luminosity of the stars, as well as the spectral classes." "Binary systems because I didn't realize that stars could orbit each other. I also thought it was interesting that there could be various ways they can orbit another star." "How dang smart astronomers must really be. I am obtaining so much new information about astronomy my brain wants to explode. I think its interesting that they can look up and see a star and can tell how hot or cool it is by color and some sort of mathematical equation. It's outrageous!" "The Stefan-Boltzmann law equation of luminosity, temperature and size is very interesting. I love working with equations." 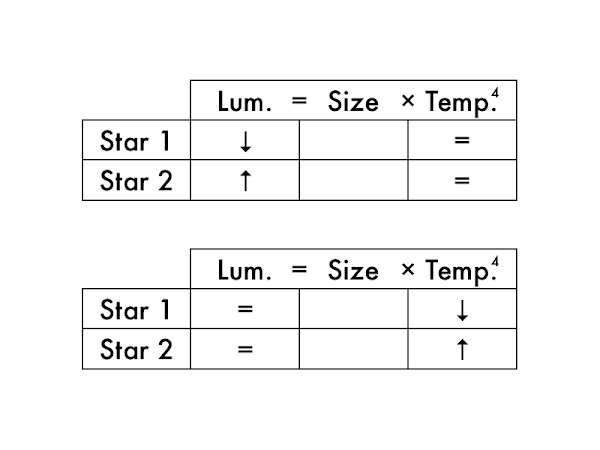 "The process of finding a star's size." "Wien's law--the fact that color can tell us so much is amazing." "I was confused on whether moving a star away would affect its apparent magnitude or the absolute magnitude." "The difference between apparent and absolute magnitude is confusing between it's not too clear in the presentation." "I was confused by parsecs, and I am not sure how parallax measurement works." "I didn't understand how moving a star to 10 pc would put it at a state where it would be at its absolute magnitude?" "The magnitude scale that is used to measure star brightness is a little confusing to me. I understand the basic ranking, and the absolute magnitude vs the actual magnitude, but the info about the parallax is confusing to me. If there comes a point where I have to discuss it in an essay question response, I think I would struggle. Similarly, I really liked reading about Wien's law and the Stefan-Boltzmann law, but read the end of the presentation where you said to make sure we understand the concept enough to be able to write about it in an exam essay response. This warning made me realize that I might need a little more help just wrapping up the two concepts together neatly to ensure that there aren't any loose ends." "Something that was confusing is that red does not mean hot, it means the star is cooler. While blue means that it is really hot." "It gets confusing to me when Wien's law and the Stefan-Boltzmann law needs to be used because it involves math, my least favorite subject." "I am honestly still confused about why the spectral sequence is out of alphabetical order because it just doesn't make sense, and it bothers me." "The brightnesses of stars when placed 10 parsecs away is their absolute magnitude M, and The apparent magnitude m of a star is the "as is" brightness as seen by an observer on Earth." 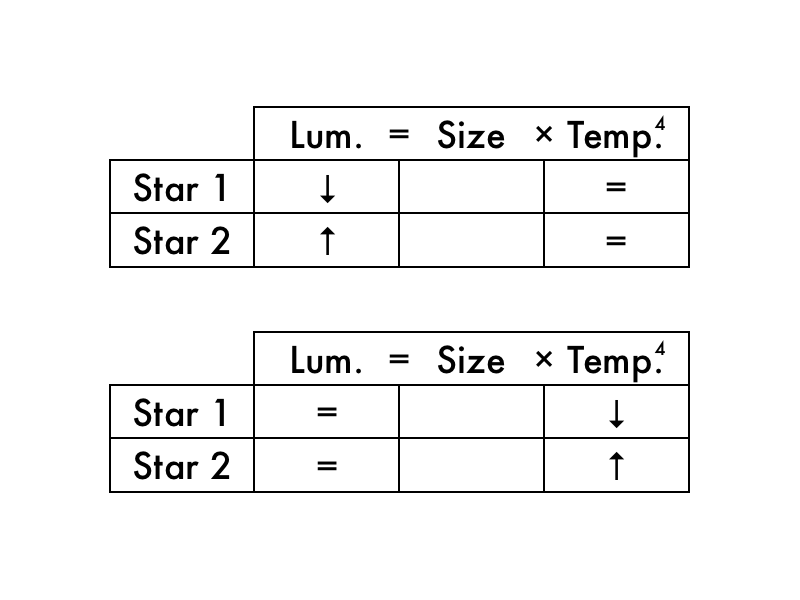 "Apparent magnitude measures how bright a star or other celestrial body looks in space. absolute magnitude measures an object, and equals how bright that object would look if it were 10 parsecs, or 32.6 light years away from Earth." "Absolute magnitude is our view of intrinsic brightness of stars from 10 parsecs away. Apparent magnitude is our view of a star's brightness from Earth." "Apparent magnitude is how bright an object appears to humans on earth. Absolute magnitude is how bright a star actually, and its intrnsic brightness." "Apparent magnitude is what we see from Earth. Absolute magnitude puts all stars at 10 parsecs from Earth to accurately compare their magnitudes." "Apparent magnitude is how we view the star relative to the distance from Earth. Absolute magnitude refers to the legitimate intensity of a star regardless of distance." "I do not understand why a cooler star can be larger in size..."
"I think this section will be a little easier to understand... At least that's what I'm telling myself." "Please explain more on this chapter. I'm very confused." "Parallax, arcseconds and parsecs, oh my! I feel like I'm in a Star Wars film and no one told me..."
"The way that this survey complemented the online lecture presentations was really helpful! Having little assignments that really forced us to think about each detail of the larger concepts really helps us to grasp the information that we are being given, and to then apply it!"